Astrophysicists at University of Rochester are working on answering questions about the formation, evolution, and deaths of stars, planetary systems, black holes, and galaxies. The astrophysics group is working on improving our understanding of these astrophysical phenomena using observations with modern astronomical telescopes, developing instrumentation and detector arrays for more powerful future observatories, and improving our theoretical understanding both analytically and through computer simulations. These advances have impacted the fundamental studies of the origins, dynamics, and emission for all scales of astrophysical phenomena -- from large-scale structure in the universe, to galaxies, to stars and planetary systems. Department faculty conduct research in astrophysics that embraces both the development of astronomical technology and the interpretation of its results. 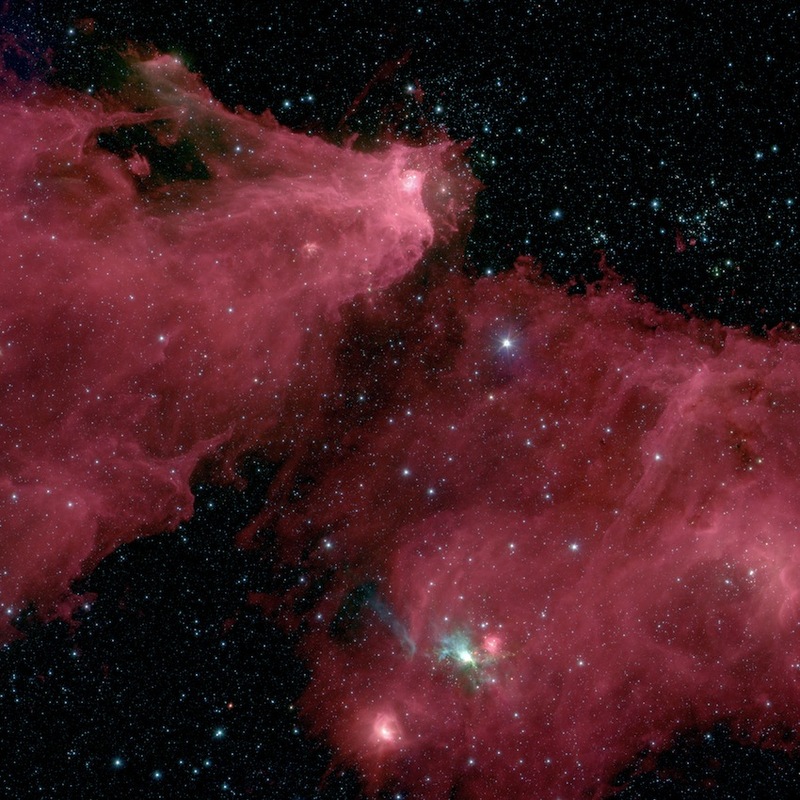 Professors Forrest, Pipher and Watson are members of instrument science teams on the fourth of the NASA Great Observatories, the Spitzer Space Telescope, which has contributed crucially to all of the "origins" studies. They specialize in observational studies of Galactic and extragalactic star formation, of planetary system formation through the evolution of the disks surrounding young stars, and in the development of sensitive infrared detector arrays and instruments for astronomy. Professor Watson is primary investigator of the Spitzer IRS Disks team, and co-investigator of the Herschel Orion Protostar Survey (HOPS) team, using the Spitzer Space Telescope and Herschel Space Observatory, respectively to investigate the chemistry and dynamics of protostellar accretion and evolution of protoplanetary disks. Professor Quillen, carries out space and ground-based observations, as well as analytical and numerical modeling, in studies of the origin, structure and evolution astrophysical disks -- spiral galaxies, active galaxy nuclei, planetary and protoplanetary systems. The Infrared Detector Group (faculty Judy Pipher and Bill Forrest; engineer Craig McMurtry; and their students) has been exploring several different technologies. After the depletion of cryogens, the two InSb detector arrays developed by our group for the Spitzer Space Telescope, sensitive from 1-5 microns are still working well. Based on this success, we have a continuing program to develop HgCdTe arrays for space astronomy, sensitive out to 10 microns, requiring only passive cooling. The group has recently succeeded in producing space-worthy devices for astronomy. Our hope is to fly these on several missions, including NEOCam, the Near Earth Object Camera experiment. We hope to extend the wavelength of operation of the HgCdTe devices to 15 microns in the future, and to demonstrate 2-color arrays for astronomy. We have also demonstrated the utility of Si arrays in THz detection, together with colleagues in ECE, Optics and at ITT Exelis and RIT. The C.E.K. Mees Observatory is operated by the department and supports the activities of the observational group, including observing projects for undergraduate courses and public outreach. The University of Rochester astrophysics group also belongs to the Small and Moderate Aperture Research Telescope System (SMARTS) consortium, which provides access to the 1.5-meter telescope and other telescopes at Cerro Tololo in Chile. The Theoretical Astrophysics Group explores a wide range of phenomena in astrophysical sources from the Sun to the most distant active galaxies. As many of the sources in the universe contain magnetized fluids or plasma, the themes of hydrodynamics, magnetohydrodynamics (MHD) and plasma astrophysics have played a role in the theoretical research programs of professors Blackman, Frank, Helfer and Thomas. Professors Quillen, Blackman and Frank also investigate planetary system and circumstellar disk evolution. With both computational and analytical approaches, the group explores such issues as the origin of magnetic fields, solar and stellar dynamos, the physics of sunspots, interstellar clouds and galaxies, accretion disks, the roles of mass outflows and magnetism in the formation and death of stars, and the physics of active galactic nuclei. The development and evolution of turbulence in astrophysical environments is a key area of research for the group. The theory group also leads efforts in astrophysical computational studies. Professor Frank leads an effort in advanced code design and application with the development of the AstroBEAR adaptive mesh refinement multiphysics code which has been applied to a wide range of studies from star formation to evolution of the interstellar medium. Quillen’s group has developed new algorithms using GPUs for modeling the evolution of proto-planetary disks. The plasma astrophysics/physics group and the Laboratory for Laser Energetics (LLE) have also combined their resources and talents to continue a program in High Energy Density Laboratory Astrophysics. The use of high energy density devices, like Inertial Confinement Fusion (ICF) lasers for investigations of cosmic environments is a new development in astrophysics, which holds great promise. Increased collaborations between astrophysicists and plasma scientists are essential for progress in this new field and together UR astro/plasma physicists and LLE scientists are pushing the frontiers of recreating the Universe’s most exotic phenomena. The Paleomagnetism Group, led by Professor Tarduno, studies the nature of Earth’s early magnetic field and the implications for Earth evolution, from core to atmosphere. Unique facilities allow Professor Tarduno and his students to measure the magnetization of individual silicate particles. The group is also investigating the magnetic signature of meteorites as probes of parent body history, giving scientists a unique window into the assembly and thermal history of the protoplanets in the early solar system. To facilitate its research activities, the department has its own in-house technology group called the Barnes Computing Center (BCC). The BCC provides students, faculty, and staff with expert assistance and support for their hardware, software, programming, and networking needs. In addition the university itself offers world-class computational clustering resources for groups that require heavy parallel processing work via the Center for Integrated Research Computing (CIRC). The University of Rochester is also home to a branch office of The Astrophysical Journal, where Professor Pipher is a scientific editor for the journal.